Leading Manufacturer of Thermocouple Connectors, Thermocouple Compensating Cables, Stainless Steel Thermowells, High Temperature Thermocouples and Metals & Evaporation Material Targets from Mumbai. Our organization is involved in manufacturing and supplying a quality range of Thermocouple Connectors. These original OMEGA thermocouple connectors are extensively used to prevent measurement errors from common copper pin connectors. All contacts such as pins & sockets, are fabricated using thermal element material that helps to avoid any faulty measurements due to fluctuations of the ambient temperature at cold junction. Further, no new thermocouples are created at the connection to ensure the optimum safety of the end user. Besides, in our range of thermocouple connectors this polarity safe design, which is also, color-coded according to the ANSI or IEC for easy identification. 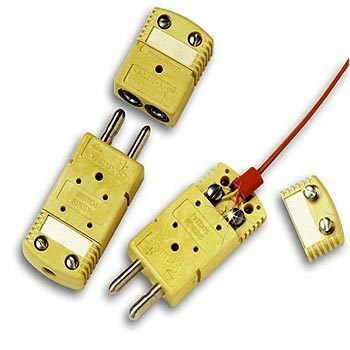 These can be used up to 200°C continuous and 260°C intermittent and the hi-temp and ceramic connectors even go up to 750°C. The thermocouple connectors are RoHS compliant and developed to provide easy connection of temperature sensors to compensating/ extension cable and increase the productivity. We are engaged in supply an extensive range of Thermocouple Compensating Cables. These are available in different combinations of conductor size and thickness, insulation material and sheath material, armoured and un-armoured to meet diverse industry applications. Besides, we also manufacture special heat resistant Nextel Braided High Temperature Thermocouple Cables. These cables are used for furnace mapping and furnace profiling in heat treatment application. Our respective range is developed as a replacement to carcinogenic Asbestos insulation, restricted by ISO 14000 certified companies. In addition to this, we also offer Silicone, Neoprene, Fiber Glass, Asbestos, PVC, Teflon insulated cables with screening for EMI/RFI rejection. These cables are colour coded as per ANSI or IEC standards, which helps in easy identification. We hold expertise in supplying a quality range of screwed, welded or flanged options, Thermowells, which is manufactured in tandem with the latest technological advancements. These are widely used in industry temperature measurement applications to provide isolation between a temperature sensor and the any of the liquid, gas or slurry environment. 1/2" or 3/4" NPT mounting threads. With our expertise in the respective field, we supply an extensive range of High Temperature Thermocouples that meet various industry applications. Our range includes Base Metal, Precious Metal & Exotic Metal Thermocouples, Sheaths and Insulators. These are available in different types and in various technical specifications as pecified by clients. The maximum temperature is based on the lowest max. temperature of the element and insulation &sheath material. Our organization is engaged in offering an extensive range of High Purity Metals and Evaporation Material Targets. These are manufactured in line with set industry standards to ensure optimum quality in the end products. We offer all metals right Aluminum to Zirconium in upto 99.9999% purity in various forms like powder, foil and shots. Apart from this, we also provide evaporation material, sputtering targets, boats, crucibles and other consumable for thermal evaporation and vacuum deposition.